It is essential to monitor the dry matter of the crop regularly, starting a month before the anticipated harvest date. Dry matter can change by 1-2% per day once the crop has reached 45% dry matter. 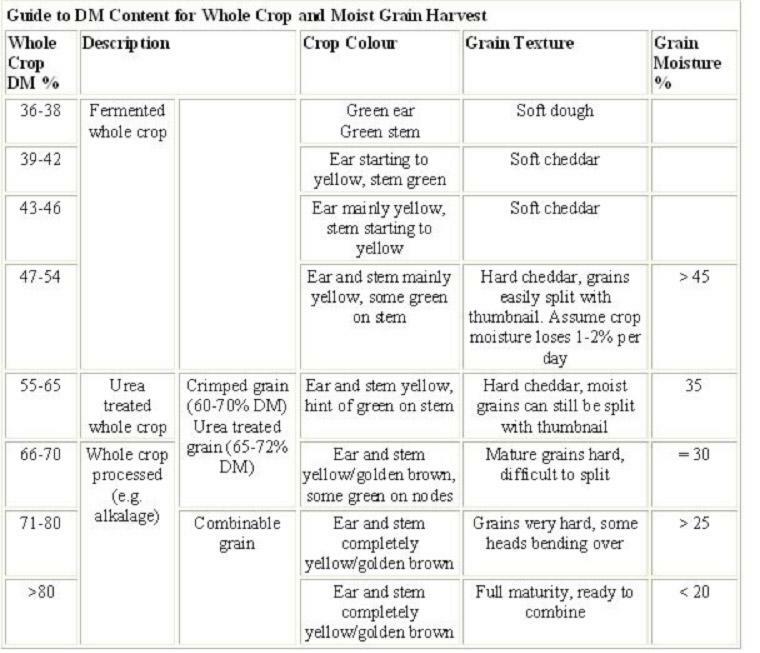 Harvesting should not take place until after the cereal grain has progressed beyond the milky-ripe growth stage – until it has at least reached the soft-cheddar consistency (i.e. above 35% DM). The crop nutritive value is effectively constant from the “soft-cheddar” stage until the cereal grain has reached the hard-cheddar consistency (approx. 55% DM) – this is a window of almost three weeks. A direct-cut precision chop harvester is preferable. Minimise losses during harvesting and ensiling. Trailers should have solid sides and backs to avoid grain losses. Crops cut with high stubble will have lower yields but higher feeding value. Crops cut with low stubble will have higher yields but lower feeding value. A short chop length (c. 2.5cm) will help reduce aerobic deterioration. Preservation should be straightforward. Silos need to be filled quickly. High DM will limit effluent discharge. Whole crop needs to be well-compacted and weighed down. Double sheet the pit to prevent aerobic fermentation. A narrow pit is preferable to reduce aerobic deterioration. 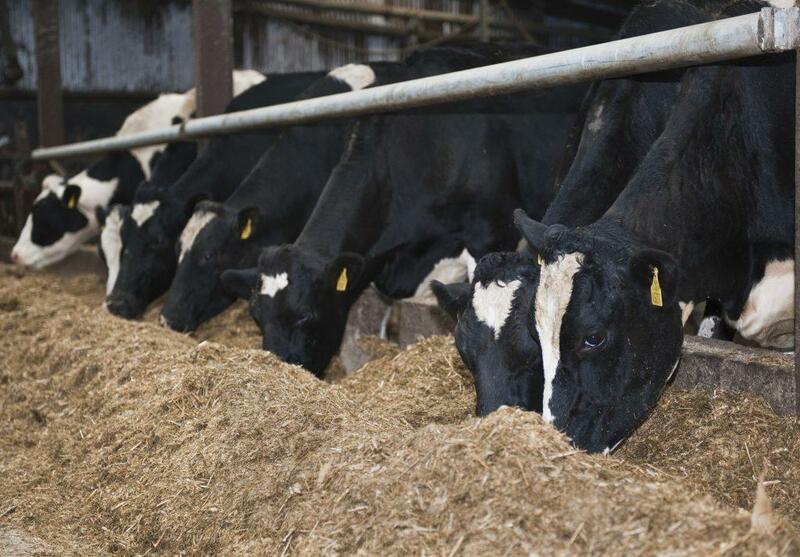 Results from Grange indicate losses during feed-out are no greater than with grass silage, where good management practices prevail. Additives should be used where WCC silage is being used as a buffer feed in late spring/early autumn or where there is a narrow pit face.. The silo should be protected from wildlife such as birds, rodents etc. Laying down bait around pits is important. Urea treated wholecrop is harvested 2-3 weeks before normal harvesting and the grain should be at the “hard cheddar” stage, minimum of 60% crop dry matter, or less than 35% grain moisture. It should still be possible to cut through grains with your thumbnail. Treating with urea at 15-25 kg per tonne of fresh crop reduces dry matter losses in the pit and makes the crop more stable. Urea needs moisture to work so the crop should not be too dry. Urea can be applied with a fertiliser spreader on the pit or mixed with the crop as the loads are tipped. Any form of urea other than feed grade should be checked for purity. Urea in excess can be toxic, so it needs to be spread evenly and ensure adequate moisture is present. There are commercial products pre-formulated available e.g. Home ‘N’ Dry which can help prevent heating and moulds at feedout and/or that aid preservation (but add to the cost). Grain for crimping should be harvested at 35% – 45% moisture content with a normal combine harvester. The combine is usually set with the sieves fully open. The grain is then passed through a crimper (a roller with dimpled or flutted rollers), which is usually at the final storage site. Crimpers can process from 12 – 40 tonnes per hour, depending on machine. In most cases an additive is then added to the grain within the crimping machine before ensiling. Crimped grain should be maintained in strictly air-free conditions throughout storage. This grain is normally stored under sealed, air-free conditions (e.g. sealed beneath conventional silage plastic sheeting) to prevent the rapid loss of the ammonia produced from the urea. The ammonia prevents mould growth and when it binds with moisture in the seed coat of the grain the resultant hydroxide effect should replace the need for mechanically rolling the grain. The commercial pre-formulated product Home ‘N’ Dry has been popular in recent years. It can help prevent heating and moulds at feedout and also aids preservation (but adds to the cost). Urea/Home N’Dry also increases the concentration of crude protein in the grain – however, the extra N is non-protein N and may be of limited value to the animal. Caustic soda treatment of grain disrupts the seed coat of grains, so that they can be fed to cattle without further processing. Grain harvested at the conventional stage (16-20% moisture). Add 3-4 tonne of grain added to the diet feeder. Add caustic soda to the feeder (Barley at 50 kg of caustic soda per tonne of grain, Wheat at 30 kg of caustic soda per tonne of grain). Thoroughly mix caustic with the grain. Once mixed, add water to the mixture. The level of water will depend on the moisture content of the grain and the length of the storage period. If the grain is to be fed fairly quickly, then enough water needs to be added to bring the moisture content up to 30%. If the grain is to be stored for more than 3 months then the moisture content should be brought up to 22%. It is important to allow the caustic treated grain to cool adequately before heaping it. Clean conditions during treatment and storage (seal tightly with a polythene sheet) are essential and conditions conducive to mould growth or mites should be avoided. High moisture grains-an economic option? What is the total cost per ton of grain in the chosen system and is this less than the cost per ton of feed purchased as required (remember, cost per ton at 30% moisture needs to be adjusted upwards to compare to typical level of 14% moisture with purchased feed)? Do you have suitable storage facilities (if not what will it cost to build or alter a shed, what are the risks of storage losses, will my facilities met requirements of the department of agriculture)? Will you require additional equipment (for treatment or handling) and if so what will this cost?